A partnership between Arlington County Government and the Rosslyn Business Improvement District is bringing a more unified, vibrantly urban look to Rosslyn’s public spaces. 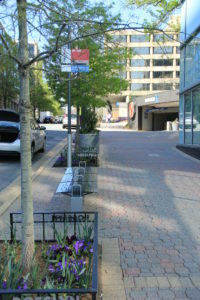 Unified urban feel for Rosslyn sidewalks. In June, the Board approved a Rosslyn Streetscape Elements Plan that County staff and the BID spent two years developing with lots of input from the public. The BID installed sample benches, planters, a bike rack, a newsbox corral, an informational marker and litter bins — all sporting the same custom, laser-cut pattern emulating Rosslyn’s nighttime skyline — a year ago on the corner of Wilson Boulevard and N. Oak Street a year ago to invite public comment. The pieces were the vanguard of a phased rollout that will continue in the coming months and years. 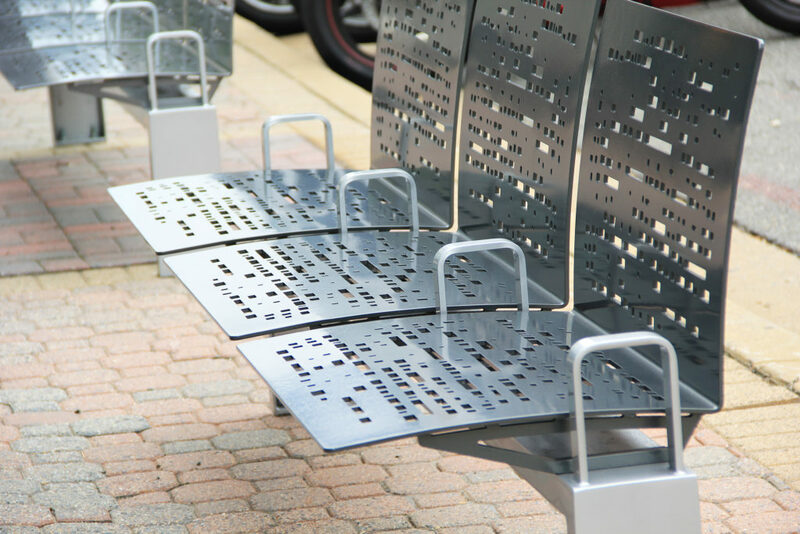 The goal: to replace “a crazy number of different trash cans, bikes racks, benches and signs out there with something with an urban vibe – a sleek esthetic,” said Doug Plowman, the BID’s Urban Planning and Design Manager. Plowman’s predecessor, Lucia deCordre, worked with New York-based industrial designer Ignacio Ciocchini to conceptualize and develop the custom pieces. Arlington has three Business Improvement Districts, public-private partnerships that are funded by an additional property tax that pays for projects within their defined boundaries. The Rosslyn BID covers 17 blocks of mixed-use development in the heart of Rosslyn. It focuses on enhancing and beautifying the public realm, marketing and promoting Rosslyn, economic development and programming community activities and events. 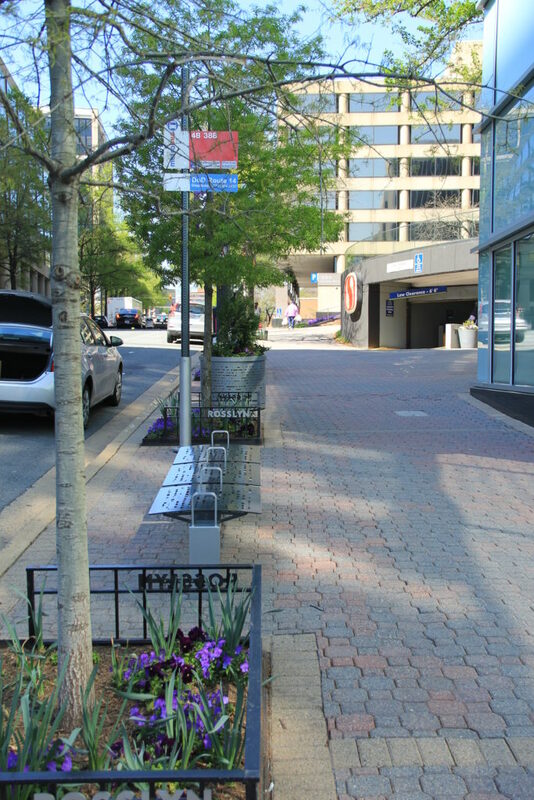 One of the most intriguing items in the Rosslyn Streetscape Elements Plan is Arlington’s first parklet, which the BID plans to install next spring on the northwest corner of Wilson Boulevard and North Oak Street. The new sidewalk furniture is not only attractive, it also is highly functional, said Maureen Goldman, Marketing and Communications Director for the BID. 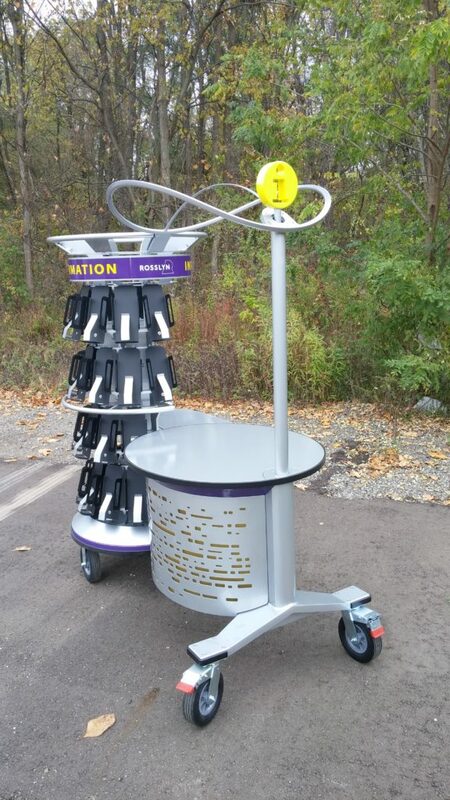 The bike rack is an unobtrusive 37-inch stainless steel ring on a charcoal gray post that provides multiple locking locations per bike. 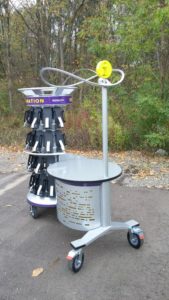 Forty-gallon garbage and recycling bins are movable, so they can be relocated to serve events or public plazas. 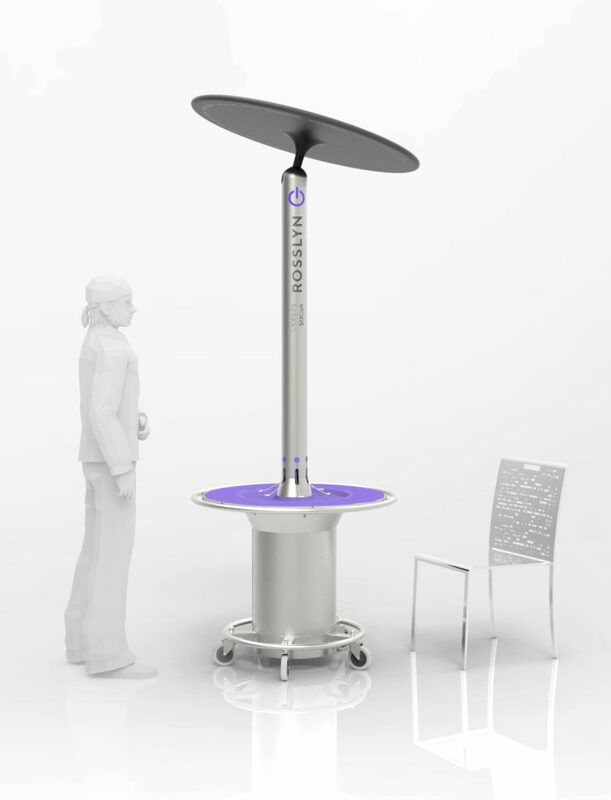 Also approved in the Streetscape Elements Plan, and planned to be rolled out in the future — a solar charging station on wheels, that up to six devices can be plugged in and recharged at one time. Three-seat benches, both backless and backed, offer extra-wide seats with space to set your briefcase or bag beside you. It all fits in with the County and community’s long-term planning effort to realize the vision in the Rosslyn Sector Plan: to reshape the second generation of redevelopment in Rosslyn’s downtown core into a more walkable, transit-oriented, lively and vibrant urban village. The Board adopted the sector plan in 2015, and the BID is all for it. Rosslyn trash can with laser image of nighttime skyline. Rosslyn’s new sidewalk benches are designed for comfort. Residents, visitors and office workers today want great public spaces. 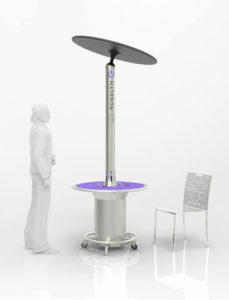 They want plazas where they can gather, outdoor cafes, sidewalks wide enough to walk comfortably, and amenities like comfortable seating, clear signage, information racks and places to charge their phones or other devices. To read the staff report on the Rosslyn Streetscape Elements Plan, visit the County website. Scroll down to Item No. 12 on the agenda for the June 17, 2017 Regular County Board Meeting. County Board Chair Jay Fisette lauds Arlington's progress and looks to its future at "State of the County" event.